Happy Christmas and New Year to all who love heathers. One to look out for in the new year, a very distinctive heather for spring. Soft pink flowers on axillary shoots in terminal whorls of 3–5; calyx with 4 unequal lobes, waxy, thicker in texture than corolla, usually white with green or yellow-green tips; corolla ovoid, pink, to 5mm long; stamens 8, often malformed; anthers without spurs; III-V, with mid-green foliage which is tipped with vivid orange in spring. 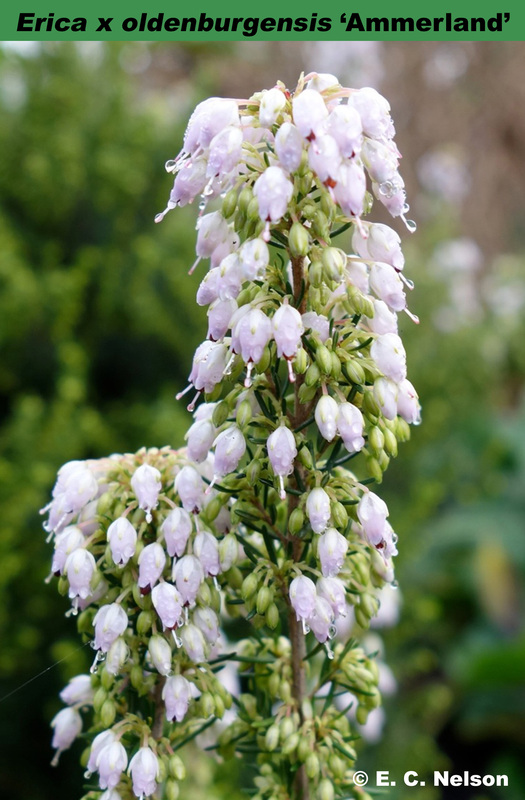 Looking more like Erica arborea, it has a much more compact and rounded habit up to 1m tall; leaves in whorls of 3, linear, to 1cm long. Deliberately created hybrid between tree heather (Erica arborea) and winter heath (Erica carnea)which have inherited the hardiness of the winter heath, created by Kurt Kramer (Edewecht, Germany). They exhibit brightly coloured new growth in spring. Lime-tolerant and suitable for zones 5-9. Named after a region in northern Germany. A hybrid deliberately raised by Kurt Kmamer, Edewecht-Stiddorf, Germany, c. 199?